On-Stage, the musical instrument accessories division of The Music People, is now offering the TBM7000 Straight Trombone Mute and the GTP7000 mini pedal tuner. TBM7000 Straight Trombone Mute is for professionals as well as students. The pitch-neutral spun aluminum TBM7000 features a natural cork gasket for a precise bell fit that attenuates volume while preserving accurate intonation. 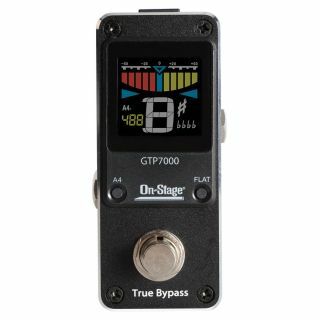 The GTP7000 mini pedal tuner is complete with over-sized, high visibility four color strobe or half strobe display. The compact chromatic mode tuner integrates discreetly and securely with any effects board. The 9v DC powered GTP7000 also boasts a 430 - 450Hz pitch range and +/- 0.5 tuning tolerance as well as true bypass circuitry for absolute signal integrity.